And so, the ever-growing list of forthcoming releases swells with yet another interesting title…. George Harrison’s Dark Horse Records has just announced a new box-set package called “Collaborations”. And yes, it too is coming in October. 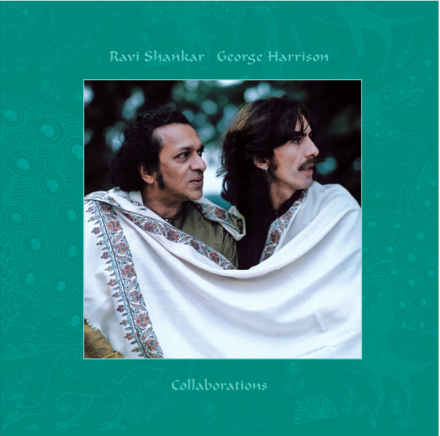 Dark Horse Records announced today the October 19th release of a limited edition deluxe box set, entitled “RAVI SHANKAR GEORGE HARRISON – COLLABORATIONS“. 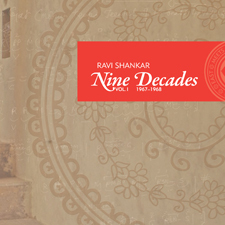 The release honors the sitar master’s 90th birthday. “Collaborations” is a 3 CD and 1 DVD uniquely numbered limited edition box set. 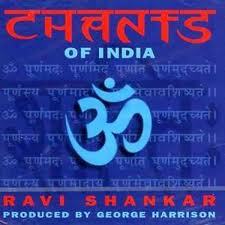 All compositions were composed by Ravi Shankar and produced by George Harrison over a period of 20 years. The DVD is a rare concert performance of the Ravi Shankar’s “Music Festival From India”, recorded at London’s Royal Albert Hall in 1974. 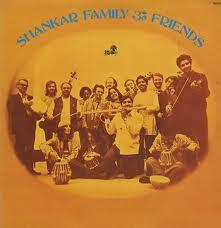 The albums include the acclaimed “Chants Of India” (1997), “The Ravi Shankar Music Festival From India” (studio version 1976), and “Shankar Family & Friends” (1974). The 56-page book includes a foreword by Philip Glass, a history of George and Ravi “in their own words”, and rare photographs from both family archives. The official website has the full press release. Steve Marinucci has details in his Examiner column, and Wog Blog also has information on his site. 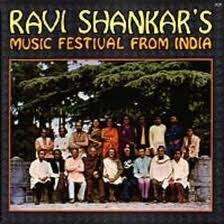 I could be wrong, but I think this is the first time that “The Ravi Shankar Music Festival From India” and “Shankar Family & Friends” have been issued on CD. Speaking of Ravi Shankar, the master sitar player (who had such an influence on George Harrison and the Beatles) has embarked on a huge archival project of his own – with a series of discs being released on his East Meets West label. The next release in the series will be the soundtrack to the movie “Raga” – which was originally issued on Apple Records in 1971 and features George Harrison. Details about the release schedule so far is here, and it looks like the “Raga” release will be a CD and DVD double which is good. 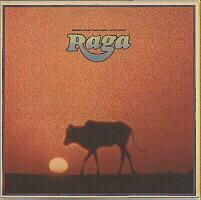 “Raga” is due in the “American fall” – which is a bit vague but I guess that could mean yet another October release? October is going to be one very expensive month for us die-hard, complete-ist collectors. We’ll have to put out hands in pockets for the 70th birthdate Lennon “Gimme Some Truth” material; the remastered Apple Records catalogue; the Shankar/Harrison “Collaborations”, and “Raga” now as well. That’s not to mention “Band on the Run”, the first of the Paul McCartney re-issues on Concord Records that is due sometime in August….. This entry was posted in Apple Records, Beatles, Beatles Collecting, Beatles Music, Beatles Related, Beatles related DVD, George Harrison, John Lennon, Paul McCartney, Rare Beatles, Ravi Shankar and tagged Apple Records, Beatles, Beatles Collecting, Beatles Related, Collaborations, George Harrison, John Lennon, Music, Paul McCartney, Ravi Shankar by beatlesblogger. Bookmark the permalink.